The "Brolgas" sculpture commemorates the construction of the Federation Bridge over the Murray River in 2005. 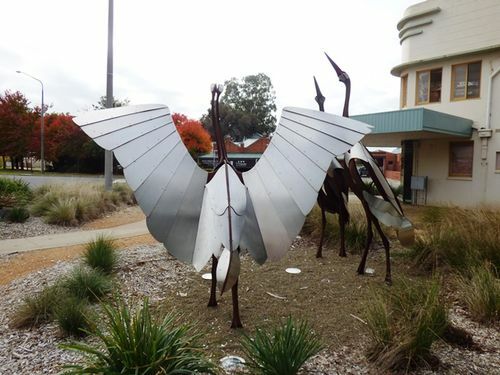 The sculptures were unveiled on the 150th anniversary of the proclamation of the town of Corowa. The Federation Bridge is a cast on site and push bridge, the first of its type on the Murray River. That means that a 195-metre bridge deck was constructed out of concrete on the northern bank of the river and was then pushed, piece by piece, out over the river until it touched the southern side. The new bridge has become a preferred and alternate crossing place to the John Foord Bridge, an aged wooden structure that was built in 1895, more than 100 years ago.